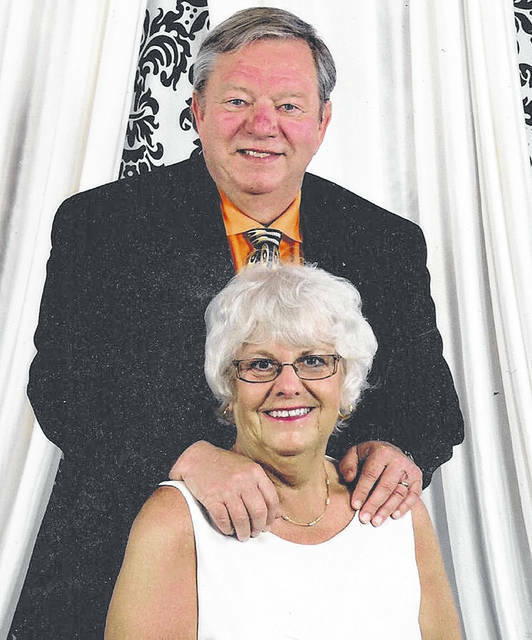 NEW HAMPSHIRE — Mr. and Mrs. Michael “Mike” Lawrence are celebrating 50 years of marriage with an open house buffet from 4 to 8 p.m. Feb. 16 at the Waynesfield Lions Club. Please omit gifts. They are planning a European cruise in August. Lawrence and the former Rebecca “Becky” Arthur were married Feb. 16, 1969, by the Rev. Harold Mowery at New Hampshire United Methodist Church. They are the parents of three children, Chad Lawrence, of Waynesfield, Shane (Stacey) Lawrence, of Dublin, and Natasha (Richard) Wilson, of Raymond. They have five grandchildren. They have also hosted 11 exchange students from around the world who still call them Mom and Dad, and they are planning to visit a number of them while cruising. The Lawrences are the owners and operators of Lippincott Plumbing, Heating & Air-Conditioning, Inc. for the past 45 years and Ace Electric Co.